Lake Texoma's pool elevation is 618.02.It is still slowly dropping back to normal levels. With the flood gated releasing around the 9800 cubic feet per second (cfs) compared to the 25-20,000 cfs range fishing has definatley picked up. The fishing is good all day with bigger fish being caught in the morning and a lot of short chunky fish in the afternoon. Almost all the fish I've been catching this past week have been taken from the shallows and flats which is typical for where they should be this time of year. I've found fish just about everywhere I've looked, definately a good sign. 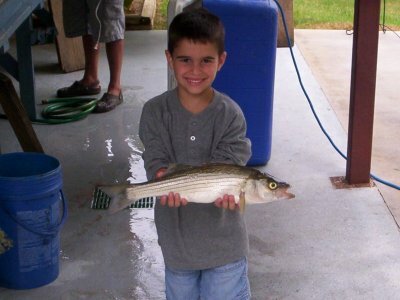 The stripers on Lake Texoma have finally bunched up into large schools which makes for easy pickings.